Home > Learning Disabilities > What is ADHD? Is your child always on the go, talking incessantly, squirming, climbing and fidgeting when everyone else is sitting still? Does he blurt out answers, grab from other childrenand hit when he's upset? Is he easily distracted from tasks, never finishing homework,making careless mistakes and skipping from one unfinished job to another? At this point, most parents will be nodding, agreeing that their child has done all of thosethings at some time. But don't worry, your child is probably just a typical, high spiritedtoddler, and he'll probably grow out of it. But if he doesn't, and these behaviours seem tohappen all the time, affecting his functioning at home, school or play, then he may bediagnosed with attention deficit hyperactivity disorder (ADHD), and may well beprescribed stimulant drugs such as Ritalin. ADHD is really just an exaggeration of certain normal childhood behaviour patterns,occurring at an age inappropriate level, and interfering with normal functioning. According to American research, ADHD occurs in 3-7% of all children, meaning that in aclassroom of 25-30 children, at least one will have ADHD. UK studies suggest that closer to 2% of children are affected. It's commoner in boys than in girls and reported rates vary widely between differentcultures. For example, studies comparing London to Hong Kong found higher rates inHong Kong, possibly because hyperactive behaviour has a greater impact in the HongKong environment, which attaches particular importance to academic success. Is it Our Fault That Our Child Has ADHD? After a child is diagnosed, parents are often worried that they are somehow to blame.This concern can be unbearable when the effects of the child's behavioural problems arealready leading to disruption, stress and tension for the whole family. It may be reassuring to hear that the experts don't believe that ADHD can result onlyfrom child rearing methods. If your child has ADHD, it's NOT because of "somethingthat you've done". But social factors can certainly influence how badly the child suffersfrom it. Having said that, attention disorders often run in families. About 1 in 4 of the closerelatives of ADHD children also have ADHD, so genetics do seem to play an importantpart. Of course, in previous generations such children were often just labeled as unruly,disruptive and difficult. Apart from genetics, there are lots of theories about other possible causes of ADHD,some supported by scientific evidence, others less so. Environmental agents such as smoking and alcohol during pregnancy, and lead exposurein young children may be linked to higher rates of ADHD. In the past, there have beensuggestions that food additives and sugar could cause attention disorders, but in fact thestudies on this subject have found no evidence to support a connection in most ADHDsufferers. How Can I Tell if My Child Really Has ADHD? 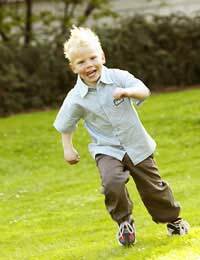 Not all active, inattentive, impulsive children have ADHD. Most parents have at sometime wondered if their child is driven by a motor, and wished they could find the "off"switch, or been frustrated because he just doesn't seem to listen, is easily distracted, losesthings, blurts things out without thinking, fidgets and climbs all over the furniture.But don't worry, these behaviours are all quite normal, if they occur at an age appropriatedegree. There's no simple blood test, X- ray or scan that can confirm ADHD, so the diagnosis hasto be made by an experienced specialist, who has gathered information directly from thechild, the parents and the teachers. The behaviours have to appear before age 7, continuefor at least 6 months and cause a real handicap in at least two areas of the child's life.Areas affected may include classroom, playground, home, in the community or socialsettings. So if your child has many of the symptoms mentioned above, but he gets on well atschool and with friends, he would not be diagnosed with ADHD.The actual diagnosis must be made by a doctor, usually a child psychiatrist, paediatrician,paediatric neurologist or GP. Other professionals who can be helpful in contributingobservations, include psychologists, speech therapists, teachers and health visitors. Could it Actually be Something Else? Behaviour may appear ADHD-like after a sudden life change or trauma, such as parentaldeath or divorce or job loss. Ear infections can cause intermittent hearing problems thatmay cause apparent inattention. Anxiety, depression, disturbed sleep, learningdisabilities and some types of epilepsy or autism may also cause behaviour that can bemisinterpreted as ADHD. That's why full assessment by the right medical professionals is so important to preventchildren from being incorrectly labelled and treated for ADHD. Yes. Affected children may have many different combinations of symptoms ofhyperactivity, impulsivity and inattention. Also, different symptoms may appear indifferent settings. A child who can't sit still at school and is aggressive to others may be easily noticeableand seen as having problems with discipline, but a passive daydreamer who doesn't reallypay attention may be overlooked by teachers. Yet both children may benefit from assessment for ADHD.ADHD can be horribly disruptive for the whole family. If it is diagnosed, then thetreatments described in the next article can greatly improve quality of life for everyone.